Native to Southern Japan, the elegant Dwarf Hinoki Cypress, or Chamaecyparis obtuse grows into a distinctive, handsome tree. With distinct care needs, this bonsai is rather particular and will usually not thrive unless its caregiver is vigilant, which is not meant to deter the beginning bonsai enthusiast, rather, it is meant as encouragement for success. This particular type of false cypress tree is much heartier than other varieties of its species, and is more prone to survive because of that feature. Most Chamaecyparis species are hardy to -10F, but under such cold conditions are constantly in danger of die-back from cold, drying winds which is why some degree of frost/wind protection is advised when kept as an outdoor bonsai. This bonsai can also be grown indoors during the winter months, as long as it is kept in a bright, airy location away from any heat sources. Providing ample access to full sun, in all but the hottest climates, is essential for survival. Without proper lighting, lower and inner branches will turn brown and die, which is a serious problem because Chamaecyparis will not bud back on old wood. This plant is considered to be quite touchy about its moisture levels. The false-cypresses in general tend to drink a lot of water, especially when in an active growth phase and can never be allowed to dry out completely if expected to survive. However, excess water is the number on e cause for root rot development, and ultimately the demise of the tree. The lack of humidity during drying winds of summer or winter can cause foliage die-back. The best strategy for health is to use very fast-draining soil, water moderately in the morning to ensure it never stands overnight in water, and allow it to dry somewhat between watering. Supplement humidity needs with frequent misting and a humidity try filled with stones. Fertilize this bonsai every two weeks, from early spring to mid-autumn. Chamaecyparis is a lime-hater and will prefer an acid loving fertilizer. The major styling challenge for false cypress is the combination of rapid growth, die-back from lack of light, and refusal to bud on old wood. 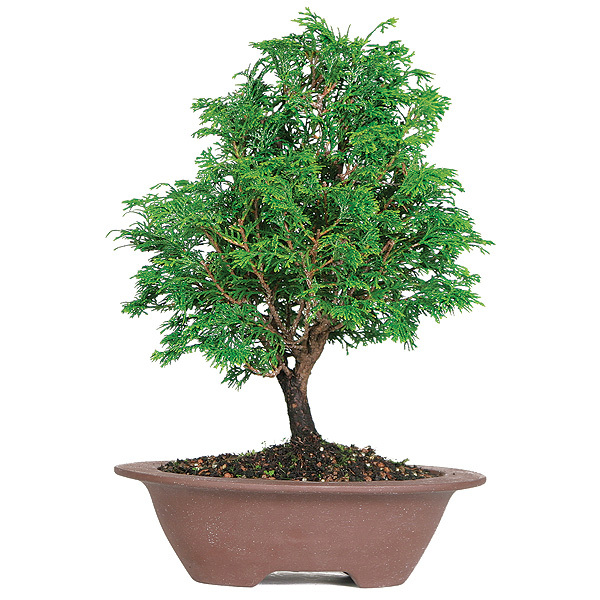 If Chamaecyparis isn't pruned constantly, inside and lower branches will die and never grow back, making bonsai maintenance a little difficult. The tree is best shaped through constant pinching of new foliage and it is important to remember to never use scissors to prune this bonsai, as the foliage always browns where cut. Hinoki cypress also tends to form awkward whorls of foliage if not properly pruned. Most false cypresses are easy to wire, however the branches may take a while to set and may need to be re-wired several times to avoid any bark damage from occurring. It can be wired at any time of year, but as wiring is stressful for this type of bonsai, it is best to wait three months after repotting before attempting to wire. Providing your bonsai with the ideal conditions will go a long way in preventing pests and diseases from occurring in your plant. Root rot is prevented with proper watering conditions, leaf burn is prevented with protection from scorching sun drying cold and moisture depleting winds and preventing stress in your plant will be the best defense against bugs. That being said, sometimes scale insects will invade this type of bonsai. They can be controlled manually by simply scraping them off with a sharp knife taking care not to injure the bark. Apply rubbing alcohol to the shell of the scale and insure that all shells are removed as the eggs are protected by that hard covering and are more than happy to infest your plant with vigor. Cuttings can be most easily taken from young wood in July or August and will root readily in any growing medium. Repot every two to four years in early to mid spring when the bonsai is young, every three to five years after the age of 10. Your soil mix will depend on your conditions: fast-draining is the best idea for most environments to prevent root rot, but a richer mix might be preferable in extremely hot areas to keep the roots from drying completely. Hinoki cypress has vigorous roots, and may need to be repotted every second year, removing as much as 1/3 to 1/2 of the root mass. Be sure to avoid using pots that are too large, as this keeps them too wet. Be sure to keep the foliage of your tree free from dust to ensure proper cell development. As a side note of interest, Hinoki means "fire tree"; it was used to make fire by friction, a practice still employed at Shinto shrines.